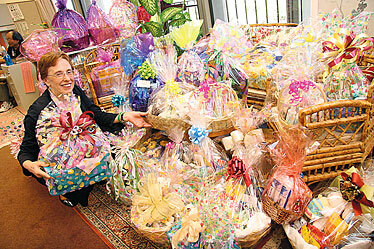 State Rep. Marilyn Lee displayed Easter baskets stacked in her office yesterday as part of a drive sponsored by the Women's Legislative Caucus. Legislators gathered essential items for the baskets that will go to homeless men, women and families served by the Institute for Human Services. They expected about 200 baskets. 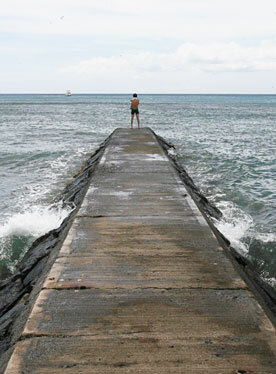 Yanagida Takeshi surveyed the waters off Kapiolani Beach Park in Waikiki yesterday.